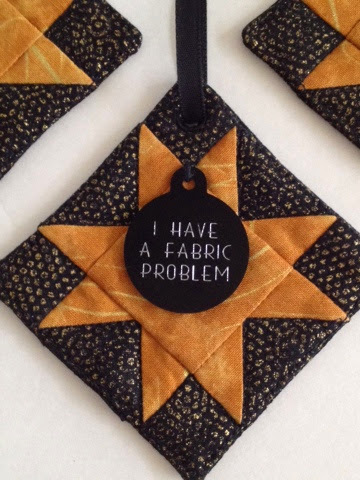 I chose to make some ornaments this month with my fabric. First. 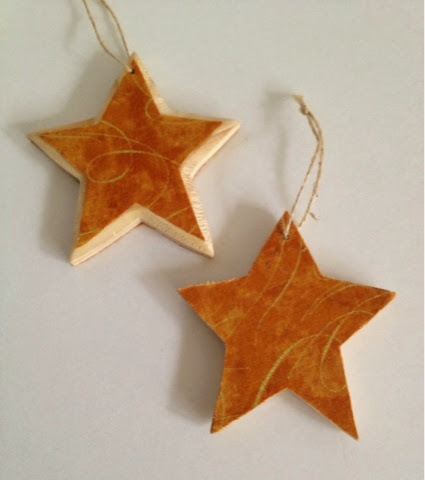 I had some wooden stars (Carved Ornament by Celebrate It) which I traced onto freezer paper and used to cut out my fabric. I removed their hangers, then glued the fabric onto the wood using Aleene's Clear Gel Tacky Glue. I did one side, let it completely dry, then did the other. 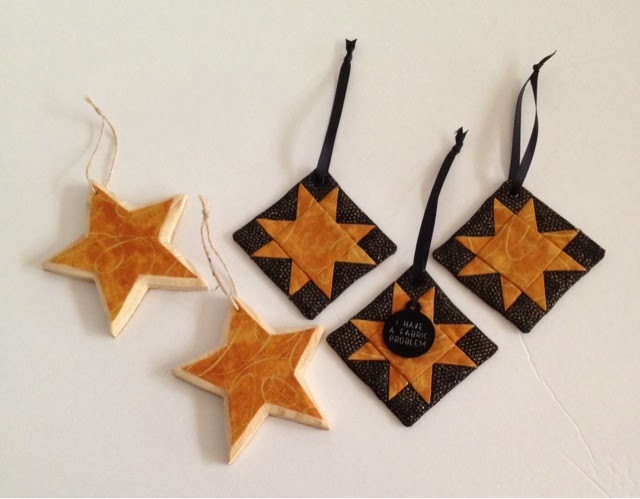 On the front side, I cut back the size of the star some to match the bevelling of the wood. I replaced the hangers and was done - quick & easy, if you don't count the drying time. I got the embellishment made through a local Etsy shop Flouster. It's actually a dog tag but you can customize any wording you want and pick your font too! I know a few people who can hang it year round in their studios :). The actual ornament is one from a collection in the project A Bit of Cheer at AllPeopleQuilt.com, the Variable Star Ornament but instead of binding it, I turned it and added the eyelet for the hanger. I did have issues with the eyelet on one but from the front it looks fine (it didn't catch the back layer of fabric) so I decided to leave it as is rather than trying to remove it & replace it.